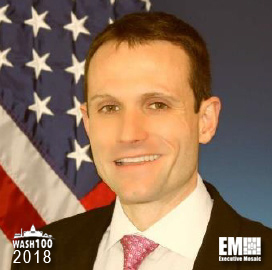 Executive Mosaic is honored to introduce Dr. Will Roper, director of the Defense Department’s strategic capabilities office, as the newest inductee into the 2018 edition of the Wash100 — Executive Mosaic’s annual selection of influential leaders in the government contracting arena — for his efforts in extending the DoD’s portfolio of advanced warfare capabilities, and his experience in pushing the limits of program requirements for new technologies. The Trump administration recently announced plans to nominate Roper as assistant secretary for acquisition at the U.S. Air Force. At SCO, he oversees the development of warfare strategies and weapon systems from existing commercial and government platforms such as swarming micro-drones, hypervelocity guns, 3D-printed technologies and autonomous fast-boats. “There is nothing like this right now in inventory — a tactical aircraft that can dispense a little expendable, fly-low surveillance asset,” Roper said of the Perdix swarming micro-drone technology. He also called on DoD to be open to prototyping technology platforms in order to evaluate the feasibility of program requirements as well as exercise flexibility when it comes to requirements of acquisition programs. “Regaining the element of surprise with systems we have today is our counter-counter move to defeat the advanced threats we face, and I’m pleased to say that many systems have been up to this task,” he said. He added that SCO also works to evolve DoD’s playbook by updating systems to blur or cross domains; adapting commercial designs and technologies; and teaming systems to develop new warfighting concepts. In a June 2017 interview with Wired, he noted about the potential use of video games in the development of new warfighting capabilities for DoD. He also cited his plans to approach the gaming industry to build systems for the Pentagon and provide it exclusive access to the technology for a limited time period. “We don’t own the product, we own the time,” he said. He assumed his current role at DoD in 2012 after previously serving as chief architect at the Missile Defense Agency. He previously served as a missile defense adviser to the defense undersecretary for acquisition, technology and logistics and worked at MIT Lincoln Laboratory. Executive Mosaic congratulates Dr. Roper and the Department of Defense for their selection to receive this award.